European Eagle by Vince Rooker, of Morpeth Camera Club. On September 8, Morpeth Camera Club members were welcomed by new chairman Glyn Trueman to the first meeting of the new 2015/16 season. Committee members explained their roles, giving a useful insight into the duties they perform. Each official then gave a short presentation of their work. Programme secretary Dave Illingworth has no specific style of photography and illustrated his talk with images of the old town of Newcastle, rusty groynes at Blyth, rust, algae, re-enactments, abstract blocks and studio shots. Newly-elected vice-chairman Mark Harrison’s taste is also varied. His photographs of HDR images, architectural detail, light trails, motion blur, long exposed waterfalls and studio shots, each with an explanation of his methods, illustrated his talent. Club treasurer Gordon Hine’s preferred genre is portraits of his grandsons, which are beautifully lit and truly capture their personalities. Colourful shots of the Morpeth Gathering, mostly interesting characters in the parade and reflections in musical instruments, were included. Our webmaster and photographic digital image competition secretary was next. 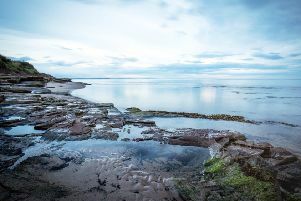 Usually an avid user of Photoshop, he showed a different side to his photography and presented an audio visual of ‘Paddy’s Hole’ at South Gare, Redcar, with photographs of colourful boats, reflections, water and ships, all taken in beautiful light, with a soft musical accompaniment. Next was Vince Rooker, president for life and print competition secretary, who celebrates 50 years of membership of the club. Vince’s still life images, shot in natural light, fruit and flowers subtly vignetted, shots taken on the summer walk of Tanfield steam trains, Alnmouth Church Hill view, children at Skipton Carnival, snowy hill tops at Loch Awe and birds of prey were included. Club secretary Dave Bisset will have a go at any genre apart from portraits. Since moving to the region he has had a special interest in the River Tyne and has a catalogue of scenes from its source to the mouth. Photographs of Kielder Water, Bellingham reflections, the Millennium and Tyne Bridges were included, plus interesting rust patterns on trucks and panels. He has a love of glass, patterns, bubbles and reflections in paper weights. Air shows, African wildlife, butterflies, puffins, cormorants and garden birds were among his selection. Stephanie Robson, publicity secretary, has a passion for sunsets, retro images, graphics, graffiti and colourful shop windows. Images of sunsets in Darwin and Italy, colourful doors at a 1960’s swimming pool, a lotus flower with insects, graffiti in the UK and France, and general observations from her travels were included, but her real passion is audio visual presentation. The chairman thanked the committee for its contributions to a very enjoyable night.